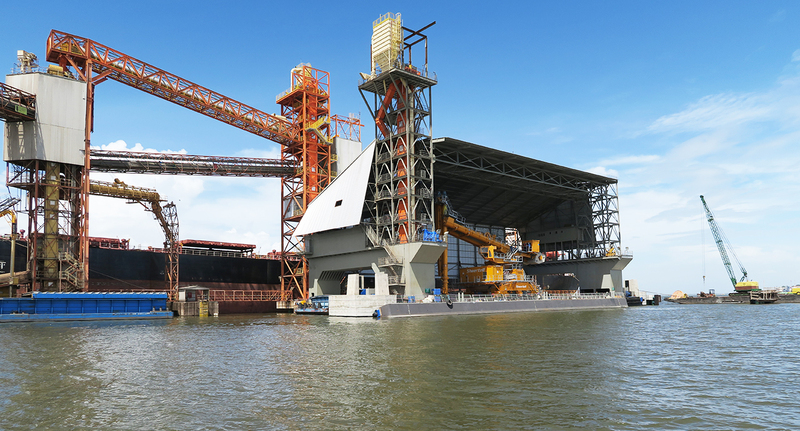 When Cargill Agricola S/A made plans to double the capacity of its soya bean and maize processing site at Santarém on the River Amazon by constructing a floating jetty, it needed a compact, lightweight, efficient and reliable unloader with excellent environmental performance. 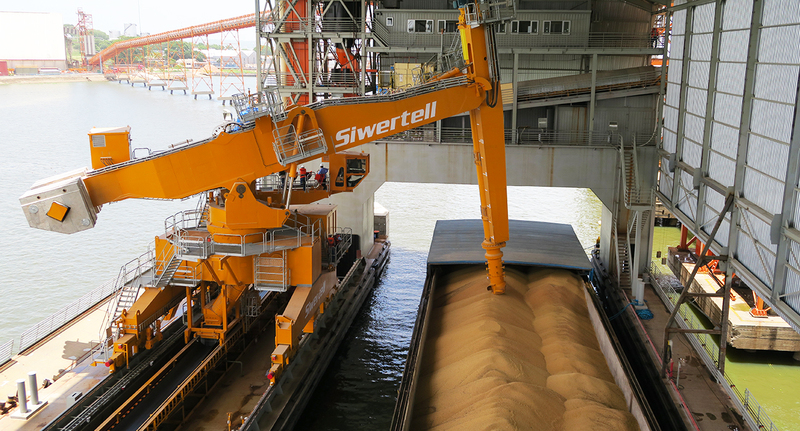 The customer wanted to more than double its agri-bulk exports from the Santarém riverside transfer terminal by augmenting its two existing pneumatic unloaders with the best system available. The tidal range of eight metres makes unloading operations very difficult alongside a fixed structure. A floating jetty solved this problem but it required a lightweight unloader to minimise the size of the pontoon. The unloader also had to be physically small enought to fit inside a canopy designed to protect the cargo operations from the elements. In addition, the unloader was required to deliver very clean discharge operations to meet strict environmental regulations. Other important considerations included high performance, efficiency, reliability, and dependable support and service. Having carefully considered all the suitable unloading systems available, Cargill decided that a Siwertell screw-type unloader was the best solution to its requirements. In 2012 it placed an order for a Siwertell ST 790-M fully-enclosed barge unloader, weighing only 252 tonnes including its counterweight. It has a rated capacity of 1,500t/h for soya beans and maize and 1,100t/h for soya meal. The floating jetty, including the roof, was designed by Interocean. Siwertell worked closely with Interocean and Cargill to design the appropriate ship unloader, taking account of all the particular needs imposed by the trade and location. Cargill purchased a large stock of critical spare parts. This prudent approach is intended to minimise the risk of unplanned downtime and reflects Santarém’s remote location far from major commercial centres. Before the expansion project the Santarém terminal exported two million tonnes per year; it now handles five million tonnes. Modifications to the conveyors have delivered a very flexible operation. 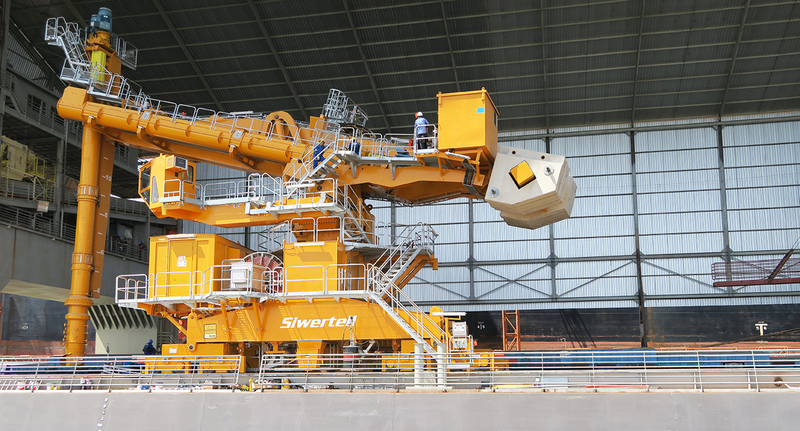 Since commissioning in 2015, the Siwertell unloader has been in almost continuous operation, with the workload split roughly 70 percent to Siwertell and 30 percent to the pneumatic unloaders. Retaining the pneumatic unloaders ensures a high level of redundancy and is an integral part of the plan. Cargill says its Siwertell unloader runs very well, easily meeting all environmental requirements. Elimination of cargo spillage raises overall efficiency while the noise level provides a safe working environment. Cargill says Siwertell delivered good, well-specified engineering supported by good quality fabrication. It highly recommends Siwertell unloaders to other operators. Soya Beans/Corn/Soya Meal unl. cap.